The first tranche of government funding will be issued to Camogie and Ladies Gaelic Football Intercounty teams in the coming weeks which will reach €428,000 in total in 2017. With the 2017 All-Ireland Championships in both codes set to get underway in the coming weeks, this funding will support intercounty Camogie and Ladies Football panels and players in their preparation throughout the year. This follows the announcement, in June 2016, by the Minister of State for Tourism and Sport, Patrick O’Donovan TD, of a two-year agreement, commencing in 2017, to provide support for intercounty Camogie and Ladies Football players. This process will provide funding of €500,000 in 2017 and 2018, through Sport Ireland, to support programmes included in a joint proposal by the Camogie Association, the LGFA and the WGPA. The funding has been released after a consultation process with all Camogie and Ladies Football intercounty teams. As part of this process, workshops were held which were attended by County Board Chairpersons/Secretaries, Team Managers and Player Representatives across both Camogie and Ladies Gaelic Football. 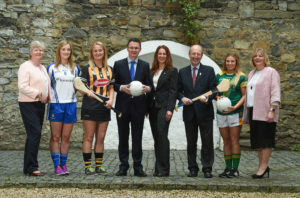 Speaking at the announcement, Minister for Transport, Tourism and Sport Shane Ross said: “This two-year programme of financial support shows the appreciation of the Government for what our Intercounty Ladies Football and Camogie players do for our sporting landscape. Every year, we see many thrilling and competitive contests. Their sporting achievements and the enjoyment that they bring to so many throughout the length and breadth of Ireland deserves to be recognised. I wish all concerned with Ladies Football and Camogie continued success in the years ahead”. Sinéad McNulty, Chairperson of the Scheme Implementation Group stated: “This investment will provide a range of valuable services, directly benefitting female Gaelic Games players across the country. Female intercounty athletes demonstrate supreme commitment to their sports, and showcase their individual talents, as well as the opportunities which sport can provide to women and girls across Ireland.